The monthly treat from our friends at Ringwood Brewery is for all the beer loving mums out there. It’s the Old Thumper beer & chocolate cake, and it’s here just in time for Mother’s Day. Beer and chocolate might seem like an odd combination to some, but the sweetness of the chocolate compliments the malt sweetness in this recipe. 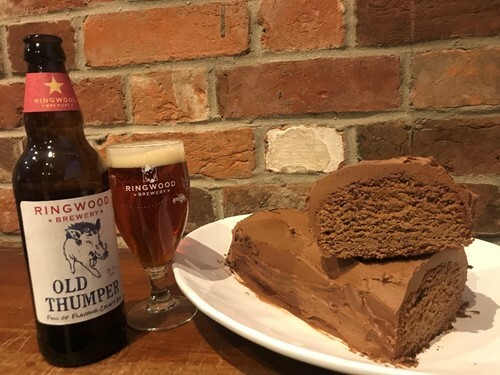 It’s especially the darker malts in Old Thumper that makes it a deliciously rich beer and the perfect match for chocolate cake. The chocolate also offsets any of the bitterness of the beer creating a perfect flavour balance. 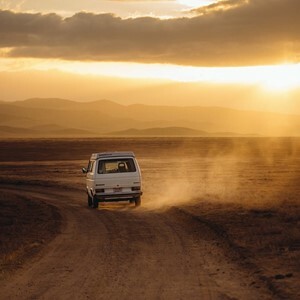 In celebration of their brand new website, Ringwood Brewery is now giving you a 15% discount on everything in their online store using the code RWB19, so what are you waiting for? Get baking! For the chocolate and ale cake, grease and flour a 25cm/10in loaf tin. Slowly mix the Old Thumper into the cocoa powder to form a paste. In a separate bowl, beat the butter and soft dark brown sugar together until smooth and creamy, then add the eggs one at a time beating between each addition. Stir in the cocoa and beer mixture. Sift in the flour, baking powder and bicarbonate of soda in batches, stirring between each addition. Pour the cake batter into the prepared tin and bake for 30-35 minutes, or until springy to the touch. Cool on a wire rack. Melt the chocolate in a heatproof bowl suspended over a pan of simmering water. Beat the icing sugar and butter together to form a soft paste. Add four tablespoons of Old Thumper and then fold in the melted chocolate. For the muscovado and malt cream, whip all the ingredients together in a large bowl until thick and smooth. When the cake has cooled completely, cut it into slices. Serve with the beer and chocolate icing spread over the cake and a dollop of muscovado and malt cream on the side. Why not go all out to treat mum this Mother’s Day? 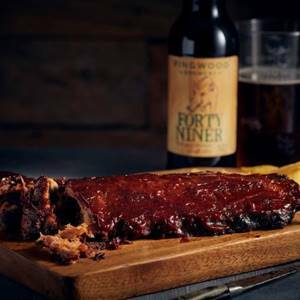 Cook up a storm and make a main course that is sure to make mum smile with Ringwood Brewery’s slow cooked sticky BBQ ribs.